Lucas and Jack is a children’s picture book written by Ellie Royce, illustrated by Andrew McLean, and published by Working Title Press, 2014. Every week Lucas's mum visits Great Grandpop at the nursing home. And every week Lucas waits for her outside. Waiting is boring! Until Lucas meets Jack. A book to bridge generations. I always appreciate finding gentle, understated children’s picture books. Royce presents us with a young character, Lucas, who like most kids thinks he has nothing in common with the older folk he sees while visiting the nursing home with Mum. Through meeting Jack, Lucas slowly realises that people like his great-grandfather - Jack who once farmed the land under the nursing home, Leo the ex-detective, and Evelyn the the ballerina who danced for the Queen - all have stories to tell. They like some of the things Jack likes too, and Jack slowly changes from a bored kid to a youngster keen to return to the nursing home next time. Royce uses lots of dialogue to advance the story, and her characters all have the ring of authenticity attributed to a true storyteller. McLean’s illustrations are perfect for this story. His charcoal and watercolour sketches complement the gentleness of the tale, and his clever use of colour really enhances the vignettes of residents’ earlier lives. Working Title have added great value to Lucas and Jack with habitually excellent teacher notes from Janet McLean. 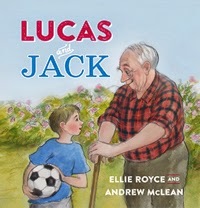 With Grandparents Day coming later this month on October 26, and lots of teachers, librarians and parents wanting a focus resource, Lucas and Jack would be an excellent picture book choice to share with kids. Students could share information about their own grandparents, perhaps interviewing them first to make sure the information is accurate! Grandparents and great-grandparents could be invited to the classroom to participate in a shared read-loud of Lucas and Jack, and to tell children a little about their lives now, and when they were young(er).